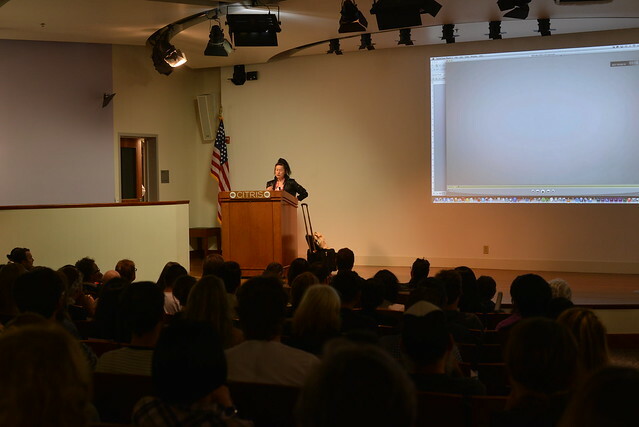 Hito Steyerl packed Banatao Auditorium yesterday and presented an array of visually striking videos connected to a wide range of topics showing the interplay between society and technology. Hito launched her idea that art is constantly evolving, and using her piece, Factory of the Sun, as an example. Although it was originally a fictional interpretation of a bank’s projects, Hito said that it became a documentary with the development of real world events. She then touched on the idea of duty-free art. Art stored in tax-free containers away from public view and possibly circulating between containers for years, in places like the Geneva Free Port. She believes that the duty-free art movement is the 21st century version of the biennial art show, and representative of our dark, and possibly dystopian future. Hito then introduced us to the background behind her ‘High Voltage’ character. ‘High Voltage’ was based on Andrea Wolf, a childhood friend who died in Kurdistan as part of the PKK. Hito’s personal experience of trying to come to terms with Andrea’s death led to the creation of Abstract and a careful exploration of provenance. One of the discoveries, was that many art spaces are funded with money linked to ammunition and military industry.